When I was younger, I used to think the stereotype of the insufferable mother-in-law was just that: a stereotype. But the more I observe, and the more quotes I receive from readers, the more I wonder whether the issue may actually be more of a two-way street. Ladies, you seem to like to hate on mothers on this site! (And men, you like to make inappropriate physical assertions… but that’s a rant for another day.) I have to say, in the wake of Mother’s Day last weekend, that kind of grinds my gears. I don’t know what annoys me more: that it’s supposed to be topical and funny to compare a man to his mother, or that the artist shaded this woman’s chin like she’s got a hefty hipster beard growing in. Maybe this man’s mother is a serial killer, or maybe she has Tourette’s, or is a kleptomaniac, or has anger management problems that render the comparison unlikely and droll. But if I was his mother, I’d want him to be a chip off the old block!
. . . Uh oh. Does that mean that I’m going to be like his mother? Or this mother? Oh, Mother. Things My Ex Said: The Cabaret had a fabulous opening on Monday night! Pictures to come! Still one more chance to see the show, this Friday at 7:30 PM! I submitted the “just like your mother” post. May I ask why it was depicted in such a light-hearted way? It happened during a heated argument and no, we weren’t cuddling at the time. Sure, Sue! 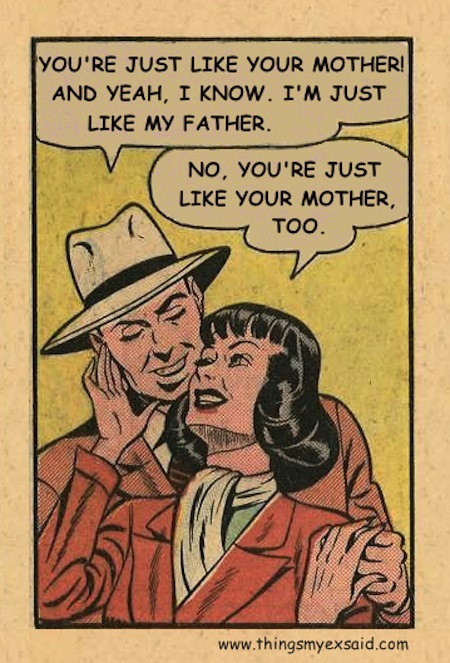 I use public domain vintage comic strips (aka I have NO artistic talent myself! ), which means that sometimes I wait a long time before I find a comic which I thinks fits a quote. All my posts fit a pretty standard “sandwich” formula: snarky comment, followed by the comic of the day, rounded out by a snarky comment. Apologies if the manifestation of your quote wasn’t what you had hoped it would be. But that’s art, right? We don’t all interpret it the same way. I look at that picture with those words and don’t see light-hearted at all: I see a cocky man getting cut down to size by a woman sneering at him with contempt. I don’t doubt your ex was a douche. But one thing is for sure: this ex sounds like he wasn’t worth another ounce of trouble or angst, be it mine or yours. I hope you’ve moved onto better men and brighter times!